When it debuted in 1982, Disney’s Tron offered an incredible glimpse of the potential power of computer-generated animation. Decades later, a sequel is hitting theaters – alongside the inevitable video game companion. Set between the events of the first movie and its sequel, Tron: Legacy, Tron: Evolution makes it clear that some gaps don’t need to be filled. Players take on the role of Anon, a digital everyman purposefully devoid of personality or other distinguishing characteristics. He’s a virtual emissary of sorts for Kevin Flynn, Jeff Bridges’ character from the films. 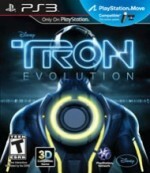 Evolution assumes that players have recently seen Tron, offering little in the way of a plot summary or expository dialog. If you don’t know your ISOs from your Basics, prepare to be completely dumbfounded by the story, such that it is. As a beta version of the Grid System Monitor, Anon can upgrade his abilities and wield a variety of different discs in combat. These include bomb attacks, which cause splash damage and can break open weakened structures; stasis fields, which temporarily freeze enemies; and corruption discs, which cause debilitating damage. There are a handful of different enemy types, each vulnerable to different attacks. On its surface, combat, like everything else in Tron: Evolution, sounds satisfactory at the least. Unfortunately, the execution is bungled up to the point where it’s barely functional, let alone fun. Targeting is erratic, particularly when facing groups of enemies – a frequent event – and camera issues compound the problem. It’s especially bad when you backflip close to a wall and the camera freaks out trying to determine where Anon went. In addition to backflipping, Anon has to traverse the game’s world using other acrobatic means. Wall-runs and mantle jumps are commonplace, and navigating those sections is one of the more frustrating experiences I’ve had in years. Anon is a touchy fella, prone to rolling off of ledges and falling into oblivion. I’m all for games with agile characters who can create exhilarating, fast-paced moments. Tron: Evolution leans too much on the acrobatic sections, particularly since Anon moves like a drunken missile. Aside from the awful on-foot sections, sometimes Anon finds himself at the helm of a light cycle or light tank. Where the core game is frustrating and twitchy, the vehicular segments are dull and boring. The light cycle segments give players an excuse to rip down a straightaway and dodge obstacles – never mind those iconic arena battles from the first movie. The tank portions are plodding exercises in creeping ahead and shooting at the occasional enemy. Both of these diversions last way too long, though they’re a nice change of pace from de-rezzing blindly off ledges. Tron: Evolution’s multiplayer is a high point, mostly because it’s the only part of the game that actually feels like Tron. Up to 10 players can battle in arenas, which make good use of the game’s weapons and vehicles. Players can summon their light cycles at will with the press of a button, and it’s cool to jump into the air as a person and land as a vehicle (a situation that never happens in the campaign). Unlike the campaign, the light cycles function as they did in the movie, leaving semisolid bands of color that damage anything that touches them. Tron: Evolution will probably have a handful of defenders, but I can’t reasonably suggest that anyone play it. It’s a shoddy experience that ultimately isn’t much fun. Tron superfans would do better simply watching the movie again and calling it a day. sequel, Tron: Legacy, Tron: Evolution makes it clear that some gaps don’t need to be filled.